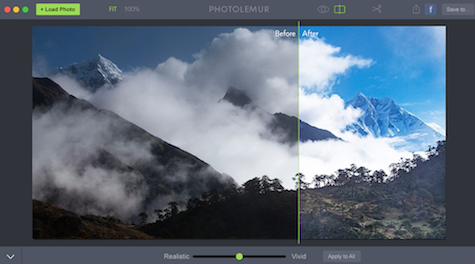 Photolemur is a new Macintosh app that takes the work out of enhancing photographs. All you do is load your photo into its workspace and it immediately improves it based on its calculations of the kind of picture it is. Using Artificial Intelligence, it does a fairly good job of determining whether the photo is a portrait, landscape, or an architecture features feature like a bridge or a church. Once a photo is loaded, a vertical line appears down the center of the screen with Before and After on either side. To the left you see your original photo, to the right you see it after Photolemur has automatically adjusted it. If you like what you see, slide the vertical line to the far left and –bingo!– the whole image is vastly improved. Photolemur developers understand that Artificial Intelligence is just that, and the end result may not be quite to your liking. As a result, this app that does just about everything automatically includes a slider at the bottom of the workspace that puts some control at your fingertips. The right end of the slider is labeled Vivid; the left is labeled Realistic. I often found that Photolemur made portraits too red by default and sometimes too plastic looking, so I would move the slider toward realistic to get more natural skin tones. 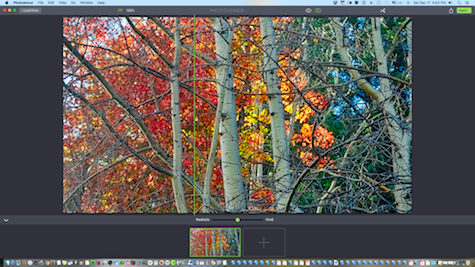 On the other hand, when I was enhancing aspen trees in October, I wanted the fall colors to be as brilliant as possible so I moved the slider toward vivid. Most of the time it’s not necessary to use the slider except in the case of portraits. The only other thing you can do in Photolemur is crop your picture using the scissors icon a the top of the work space. There are a few downsides to Photolemur. I found it very slow when loading, saving, or exporting an image, and if you want more control over the final result, you’ll have to look elsewhere. 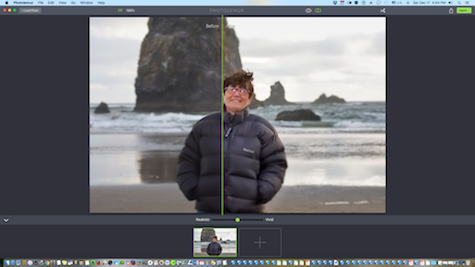 Photolemur is designed for people who do not want to spend hours learning sophisticated applications like Adobe Photoshop, Lightroom, or even the easier but very comprehensive Luminar from MacPhun Software. In short, Photolemur is a good quick fix for the non-geek and those who have busy schedules and lack the time required by more labor intensive software packages.